While the glue dries on the start/select button holder for the front case, you can move on to preparing the PCB for installation. There is a particular order that you need to install all of the components onto the PCB, otherwise you won't be able to get them all installed. Once you install the PiTFT, there is no going back, without cutting and removing all the components. It is critical that you follow the directions here on installing everything in this order, so please don't deviate from the directions. The first step to preparing the PCB is installing the soft tactical buttons for the dpad and ABXY buttons. You'll want to crimp and flatten the legs on the soft button switches to make it easier to install in the holes. You won't get a flush fit between the soft buttons and the PCB, it may be 1-2mm off of the PCB. Once you get these installed on the PCB, go ahead and solder the buttons to the PCB. Crimping legs flat on button to fit in PCB. Next you will want to install the pinouts for the other major components of the project. You will install pins for both shoulder buttons, micro USB adapter, I2S decoder, the mono amp, the powerboost 1000c, transistor, and resistor. Look at the photo which highlights all of the pinouts that you need to install at this step. For the mono amp and powerboost 1000c, use each device for template to keep all the pinouts standing correctly. Pay attention the transistor install orientation, as this has a particular direction needed! In order to keep the mono amp from grounding out or causing heat issues, I used masking tape as a buffer between the bottom of the amp and the PCB. You will need to remove the rubber separators on the pinouts for the amp, so use some needle nose pliers to just pull those off. Go ahead and place the mono amplifier onto the PCB, clip the pins, and solder it in place. You’ll also want to install the micro USB at this point as well. 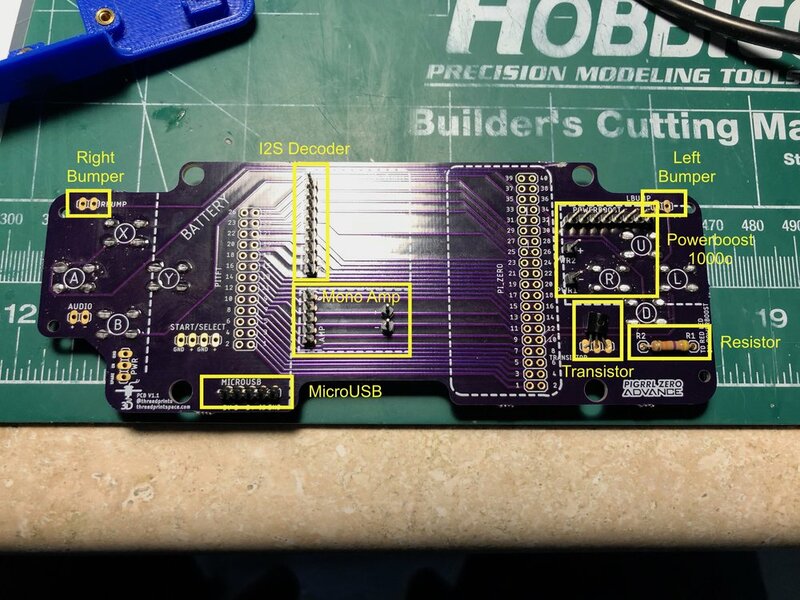 I found this to be easier to install on the back of the PCB, but people have also found success installing it on the front with the Micro USB port facing toward the back of the PCB. I think its just personal preference. Before you solder, make sure you plug it in to make sure that it’s working properly. Make sure you test the Micro USB plug before soldering!